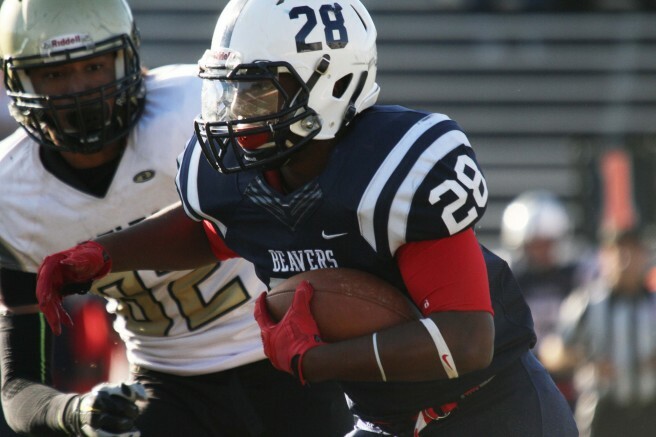 11 members of American River College’s football team were given All-Conference honors representing the NorCal League for the 2015 season, with five being freshman. On offense, quarterback Jihad Vercher, running back Armand Shyne, kicker Sam Keil, wide receiver Marc Ellis and offensive linemen Max Harrison, Kyle Mitchell and Austin Carlson were named members of the team. On defense, safety Robert Sanders, linebacker Jordan Kunaszyk, and defensive linemen Chigozie Nnoruka and Nick Terry were all named. Keil finished the 2015 season 15 of 17 on field goals and 34 of 40 on PATs, finishing with a total of 79 points. Keil, whose biggest kick of the season was arguably his game-winning field goal to beat City College of San Francisco on Sept. 26, said he did not expect the honor. Ellis won’t return to ARC for the 2016 season but does not yet know where he will transfer to. ARC’s three offensive lineman, which paved the way for 1,781 yards rushing on the season and 161.9 yards rushing per game, tied with Butte College for the most offensive linemen honored for the season. Harrison was given an all-conference nod in his third year after redshirting his first season and playing left tackle in 2014 before shifting to the right side in 2015. Despite the award, Harrison said he would rather the honor be one given to the team. “First team all-conference, that is a good thing to bring along with me as I go on to a four-year, (but) I would rather have it be a team award,” Harrison said. Carlson said he thought the award can be attributed to the team’s running backs and offensive scheme. Mitchell, who will be returning to ARC for his sophomore season in 2016, said the award helps bring attention to ARC’s football program. “Just the whole process and everything, how he do (things) here, it’s just really gratifying and humbling to be able to get that honor,” said Mitchell. Be the first to comment on "ARC football players earn All-Conference honors"